West Allis native, graduated from Central High in 1988. Went on to the University of Madison where he received his doctorate in veterinary medicine in 1995. After he graduated, Dr. Troy, as he is called, went on to practice at Hollywood Animal Hospital in southern Florida which is the largest private practice in the state of Florida. This is where he received additional training in emergency and internal medicine and surgery. In 1998 Dr. 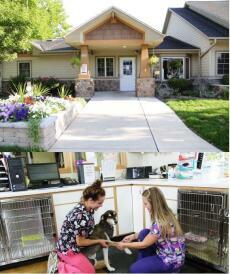 Troy moved back to his hometown and began practicing at Spirit of 76 Veterinary Clinic. When Dr. Stan Thieman retired in 2003 Dr. Troy took over the business and began the renovation as to what you see today. Dr. Troy's interests are in internal and preventive medicine, orthopedics, and exotic animals. In his spare time, he keeps active playing hockey. He played in college at the University of Madison, overseas in Sweden, was a member of the Milwaukee Flyers in the Great Lakes Hockey League for 18 years, and currently, he has the team called the Spirit 76thers on the Milwaukee Metro Hockey League. He enjoys playing hockey and golf, watching baseball games and going camping. He started his own hobby farm, including chickens, goats and honey bees! I was born and raised in southeast Wisconsin. I attended University of Wisconsin-Madison for veterinary school. Finishing school, I initially worked as a large animal veterinarian in Watertown, WI. After a few years, I moved back to SE Wisconsin to work as a small animal veterinarian, where I remain today. I have a dog named Kimi that I acquired while working here. In my spare time, I enjoy playing and recording music, and competing in various water and winter sports. Along with cats and dogs, I also enjoy seeing and treating all pocket pets. Surgery and internal medicine. He sees: Dogs, Cats and Small Animals. Dr. Lippmann, a southeastern Wisconsin native, is happy to return home after working in East Hampton for the past three years. He attended St. Georges University School of Veterinary Medicine and spent his clinical year at Murdoch University in Perth, Australia. There, he graduated with academic honors. Prior to veterinary school, he was a technician at Spirit of 76 Veterinary Clinic! In his spare time he spends it with his wife and three sons. He enjoys golfing, hiking and fishing whenever possible. Currently, he has two cats,"Boots" and "Arwen", and a dog named "Callie". Soft tissue, internal medicine and hospice care. He sees: Dogs, cats, small animals and reptiles. Dr. Anji Lippmann grew up in Florida and achieved a bachelor's degree in Biology from Florida Southern College. She attended veterinary school at St. Georges University of Grenada, completing her fnial year of study at Murdoch University in Perth, Australia. She loves to travel, read, and garden, and she enjoys home DIY. She and her husband have three wonderful sons, a dog, a cat, a tortoise, three leopard geckos, and a tank full of fish. I was 9 years old when I started out working as a stable hand at a horse ranch in Burlington, WI. I worked with goats, rabbits, chickens, ponies and horses. From cleaning the barn, taking care of all the animals, to breaking in horses, I learned from the ground up what hard work was, very quickly. I left there when I was 18 to go to college for veterinary technician training. I attended Bel-Rea Institute of Animal Technology, which is a two year intense program, in Denver, CO. There, I gained all the knowledge I needed to be a successful veterinary technician. I have special interests in animal nutrition and behavior. I grew up with a variety of animals in the house at all times. Now, after college, I have 4 cats named: El Nino, Dreamer, Chateau and Jaspurr. I also have a chocolate lab named Shaylee-Stout, and 2 Chinese Cresteds named Zuri and Zemora. I am always doing something with my animals, outside at the park, or inside teaching new tricks. My other hobbies include boating, riding horses, and camping. I love to try new things, be it food, travel or practicing new medical techniques. I started here at Spirit of 76 Veterinary Clinic in Dec. of 2008, and am now the Practice Manager. Hope to see you in soon!!! I have been working here over 20 years. I started out as a kennel person, then to a receptionist, and now I am the Hospital Administrator. I enjoy working with the clients and their pets. I am glad to be working at Spirit. It's like a second family. I live with a 3 cats at home. I have 2 children that keep me busy when I am not at work. I have been working for Spirit of 76 Veterinary Clinic since April of 2007. I have 2 cats named "Sammy" and "Libby", and a turtle named "Bubba. " I like to do a lot of things in my free time. My favorite is going to see any and all hockey games! As well as, playing sports and being outdoors including geocaching. Hey! I'm Lynette. I went to the Vet Tech Institute at Fox College in Tinley Park, IL. I started here at Spirit as an intern and was hired on as a tech in April 2012 after I completed my internship. I successfully took the VTNE and became a CVT in December 2012. I love all animals, especially kittens! I enjoy doing foster work out of my house for cats/kittens that need homes. I have several of my own kitties: "Asia," "Sobe," "Touche," and "Durango" are just a few! In my spare time I enjoy being outside and traveling! I love my job here and I hope to meet you and your fur babies soon! Hi, I'm Lydia! I started out at Spirit as a client with my dog, Catalina. I took the veterinary technician program at Milwaukee Career College and did my externship at Spirit. They hired me on as a technician in December 2014. I passed my VTNE March of 2017 and became a certified veterinary technician (CVT). I got my second dog, Nemesis while working at Spirit. I love spending my free time taking my dogs for long walks or to the lake. Hi! My name is Samantha, Sam for short. I started working at Spirit as of December 2014. I currently have two dogs, both pit bulls, Marley and Otis. I also have 3 cats, Nigel, Mellow and Baby; along with a bearded dragon and a snake. I am currently going to school to be a veterinary technician. I love being around animals! In my free time you can find me at the dog park, or just spending time outdoors. I started here in September 2014. I have decided to further my education to become a veterinary technician. I enjoy spending time with my German shepard, Zari, and my two cats, Daisy and Brandy. I love traveling anywhere tropical and taking annual vacations up north. I enjoy the people I work with, and being around animals all day is just another bonus! My name's Kallie, I am a technician here at Spirit of 76 Vet Clinic. I went to school at Milwaukee Career College, and graduated in the spring of 2015. I did my technician externship here and accepted the technician job position; and I love it! I plan to take my test to become certified within the year. I absolutely love animals and have 2 dogs of my own named Miloh and Rhani. In my free time I enjoy going on the lake and being outside. I love my job here and can't wait to work with all of your adorable pets soon! Growing up I always knew I wanted to work with animals. It was until I started working at Spirit that I knew I wanted to become a veterinarian. Currently, I am working towards obtaining a degree in Environmental Science and concentration with a minor in Spanish. Once completed, I plan to apply to a school of veterinary medicine. My ultimate goal is to become a veterinarian in general practice. As of right now, my fur family consists of two cats, Cinco and Sylvester, and a Schnauzer mix named Wiggles. I also have a foster dog from the foster group I'm involved in. My name is Haley Lipke. For my education I attended a two year veterinary technician program at Madison Area Technical College. I also performed two internships while attending this college. My small animal internship was at a mixed practice called Town and Country in Wautoma, WI and my large animal internship was at an all equine facility in Plover, WI called Corriente Vet Service. I was born and raised in West Allis, where I attended high school at Nathan Hale. I have always had at least three cats for all my life. Hi! My name is Hailey Rodiez, before starting my career here at Spirit of 76 I took care of dogs at a doggy daycare! Ive always had a passion for animals and love spending most of my time with them. In my spare time I spend a lot of time with my dog Marley a border collie/blue heeler mix. I also enjoy being with my boyfriend and family doing fun activities. I love being outdoors and going on vacations. Looking forward to working with you and your pets in the future! My name is Thomas, but you can call me Tom for short. In the past I have volunteered at an urban farm wither I have cared for goats and chickens. I also am glad to watch my friends pets when they go on vacation or are away from home for a bit. In my free time I enjoy watching and playing sports, hockey and baseball being my top picks. As well as, I enjoy being with friends and family. Hi I'm Steph! I have always loved animals and been around them my entire life. I was going for a bachelors degree at the University of Wisconsin Milwaukee in Drawing and Painting, when in my last year I decided taking care of animals was what I wanted to do for the rest of my life. I am now attending Milwaukee Career College to become a Veterinary Technician. In my free time you can catch me with my three golden retrievers: Jacie, Ginger and Candy, outside. I also have two cockatiels named Kiwi and Bonnie; an Amazon parrot named Crawford, and a rabbit named Oliver.